Stephanie Barron was born Francine Stephanie Barron in Binghamton, NY in 1963, the last of six girls. Her father was a retired general in the Air Force, her mother a beautiful woman who loved to dance. The family spent their summers on Cape Cod, where two of the Barron girls now live with their families; Francine's passion for Nantucket and the New England shoreline dates from her earliest memories. She grew up in Washington, D.C., and attended Georgetown Visitation Preparatory School, a two hundred year-old Catholic school for girls that shares a wall with Georgetown University. Her father died of a heart attack duri Librarian Note: There is more than one author in the GoodReads database with this name. See this thread for more information. 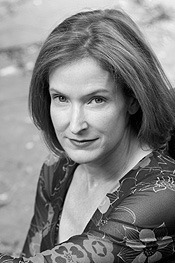 Stephanie Barron was born Francine Stephanie Barron in Binghamton, NY in 1963, the last of six girls. Her father was a retired general in the Air Force, her mother a beautiful woman who loved to dance. The family spent their summers on Cape Cod, where two of the Barron girls now live with their families; Francine's passion for Nantucket and the New England shoreline dates from her earliest memories. She grew up in Washington, D.C., and attended Georgetown Visitation Preparatory School, a two hundred year-old Catholic school for girls that shares a wall with Georgetown University. Her father died of a heart attack during her freshman year. In 1981, she started college at Princeton – one of the most formative experiences of her life. There she fenced for the club varsity team and learned to write news stories for The Daily Princetonian – a hobby that led to two part-time jobs as a journalist for The Miami Herald and The San Jose Mercury News. Francine majored in European History, studying Napoleonic France, and won an Arthur W. Mellon Foundation Fellowship in the Humanities in her senior year. But the course she remembers most vividly from her time at Princeton is "The Literature of Fact," taught by John McPhee, the Pulitzer Prize winning author and staff writer for The New Yorker. John influenced Francine's writing more than even she knows and certainly more than she is able to say. If there were an altar erected to the man in Colorado, she'd place offerings there daily. He's her personal god of craft. Francine spent three years at Stanford pursuing a doctorate in history; she failed to write her dissertation (on the Brazilian Bar Association under authoritarianism; can you blame her?) and left with a Masters. She applied to the CIA, spent a year temping in Northern Virginia while the FBI asked inconvenient questions of everyone she had ever known, passed a polygraph test on her twenty-sixth birthday, and was immediately thrown into the Career Trainee program: Boot Camp for the Agency's Best and Brightest. Four years as an intelligence analyst at the CIA were profoundly fulfilling, the highlights being Francine's work on the Counterterrorism Center's investigation into the bombing of Pan Am Flight 103, over Lockerbie, Scotland, in 1988, and sleeping on a horsehair mattress in a Spectre-era casino in the middle of Bratislava. Another peak moment was her chance to debrief ex-President George Bush in Houston in 1993. But what she remembers most about the place are the extraordinary intelligence and dedication of most of the staff – many of them women – many of whom cannot be named. Is this you? Let us know. If not, help out and invite Stephanie to Goodreads.